This document has a broad scope and is not focussed on design issues. Precast construction under seismic conditions is treated as a whole. The main principles of seismic design of different structural systems, their behavior and their construction techniques are presented through rules, construction steps and sequences, procedures, and details that should lead to precast structures built in seismic areas complying with the fundamental performance requirements of collapse prevention and life safety in major earthquakes and limited damage in more frequent earthquakes. The content of this document is largely limited to conventional precast construction and, although some information is provided on the well-known “PRESSS technology” (jointed ductile dry connections), this latter solution is not treated in detail in this document. The general overview, contained in this document, of alternative structural systems and connection solutions available to achieve desired performance levels, intends to provide engineers, architects, clients, and end-users (in general) with a better appreciation of the wide range of applications that modern precast concrete technology can have in various types of construction from industrial to commercial as well as residential. 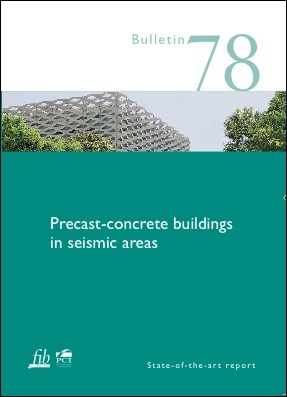 Lastly, the emphasis on practical aspects, from conceptual design to connection detailing, aims to help engineers to move away from the habit of blindly following prescriptive codes in their design, but instead go back to basic principles, in order to achieve a more robust understanding, and thus control, of the seismic behaviour of the structural system as a whole, as well as of its components and individual connections.